Sonos (SONO) the wireless speaker company is set to report their first quarter as a publicly traded company tonight after the close, less than 30 trading days from its August 1st IPO at $15, which raised $240 million for the company, which now sports a market cap of close to $2 billion. The options market is implying about a 12% one day move tomorrow and about an 18% move between now and Sept expiration (next Friday). Before I go further into SONO, I want to quickly address Roku Inc (ROKU) which will surely serve as a comp for SONO for many reasons. In Sept of 2017, ROKU raised a similar amount to SONO in an IPO, selling 18 million shares at $14 a piece, raising $250 million. Since then, despite some volatility, ROKU is up 400%, today making a new all-time high, sporting a nearly $7.5 billion market cap. In 2018 ROKU is expected to post a $14 million loss on $721 million in sales that are expected to grow 40% this year and 35% next, while still remaining mildly unprofitable. Wall Street analysts remain mixed on the name with 7 Buy ratings and 5 holds and No Sells with short interest near 13%. In its first year since being public, shares of ROKU, for the most part, have been very volatile in the day after its four earnings reports, with its average one day move of about 24%, two up, two down, and one of the declines equalling only 2%, skewing the average lower. Now back to SONO, the stock obviously has little trading history so its hard to get a sense for how the stock might react to results that differ significantly from guidance recently given on their roadshow. 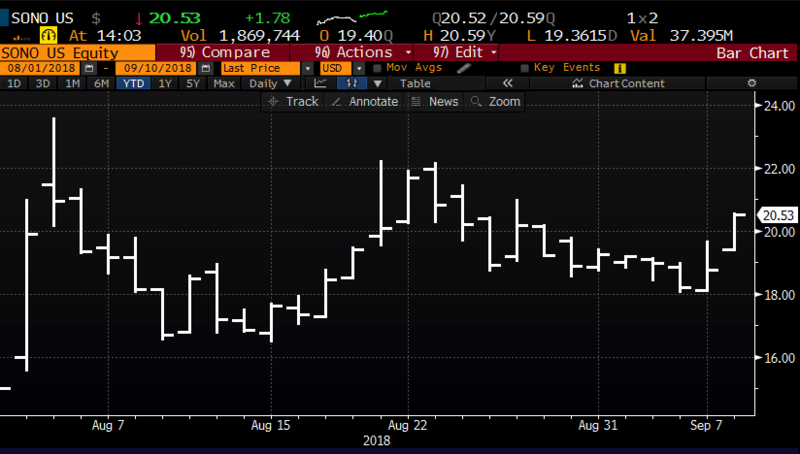 I would say that given the short distance in time since the roadshow in July that if they were to be materially different it would be to an upside surprise, but the stock’s 9% rise today incorporates a decent bit of optimism to say the least. As a longtime user of SONO products I have been very impressed, and from the moment I bought my first shiny white Apple-esque speakers and programming consoles in 2006 I thought for sure Apple would buy them. But in 2014 they paid a little more than $3 billion for Beats, a company that had about $1.5 billion in sales, which many onlookers thought was an Aqi-hire of Dr. Dre and Jimmy Iovine Beats co-founders to preside over a merged and to-be relaunched Apple Music which included their edgier Beats Music streaming service. Four years later Dr. Dre and Iovine are almost non-existent within Apple and Beats Music giving way to Apple Music which is locked in a death match with Spotify. Beats hardware is now in Apple’s Other Products category which is routinely mid to high single digit of sales, but it is not likely moving the needle. So Beats may not be a great compare, especially in the year that Apple launched its HomePod, a $399 siri powered wireless+ speaker. The competitive landscape for SONO is mired with landmines, especially as voice-activated speakers are the focus of three of the largest companies in the world, Apple, Amazon and Alphabet, but I suspect, continued product innovation, reliance on Alexa as its voice assistant and a growing piece of what might be a massive addressable market, and SONO could see a path not to dissimilar to ROKU over the past year in its first year as a publicly traded company. I suspect SONO could be a very easy acquisition for a company like Alphabet, or even Facebook. It appears that with Samsung’s $8 billion purchase of high-end speaker maker Harmon Kardon completed last year that the convergence of wireless, voice-activation and streaming content we could see more deals in the space, despite few available targets. Without reading any research, none really published yet, I am first going to listen to the company’s conference call tonight. I could easily see the stock up or down $2-3 tomorrow, and I am not sure that either would cause me to change my positive outlook for the stock. Its important to recognize one simple fact that the chart below of SONO will be the first entry in a very long series of price points, and any price movements within that range in the near term are merely new investors digesting new news. It would take the admission of some sort of financial fraud for the stock near term to go back towards its IPO price, while it would not take too much by way of positive results and forward guidance to have the stock breaking out of the recent range. If you were inclined to play for a breakout, but doing so with defined risk into the print, with the stock at $20,65, the Sept 20 calls offered at $2. 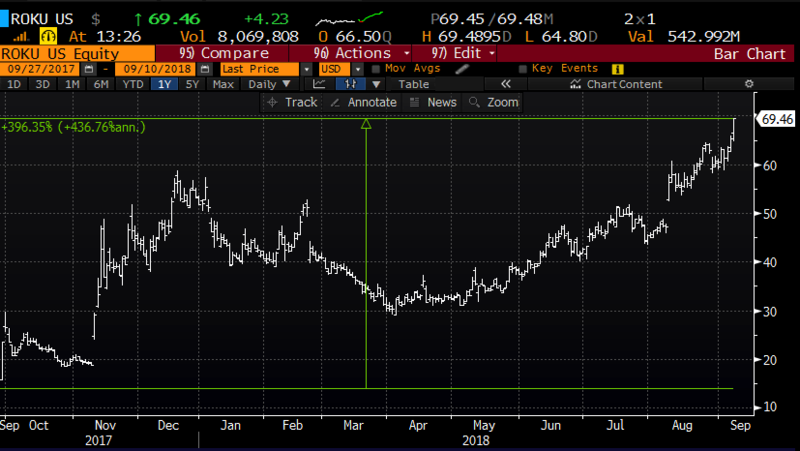 These calls are 65 cents in the money already, so the break-even at $22 is up 6.5%, which should not be hard to realize in the next 9 trading days if the company does not disappoint. But it is important to remember that if you bought those calls, you are risking 10% of the stock price for 9 trading days into a potentially volatile event. As a trader, it can be a hard way to make a living over any period of time getting too many long premium directional bets like that wrong. And with the stock up nearly 10% today, and the implied move about 12%, the stock could easily give back all of these gains on news that is just in-line. In that scenario I would likely be a buyer of the stock in the high teens.